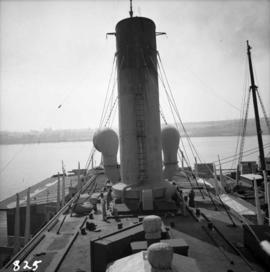 Photograph depicts the C.C.G.S. 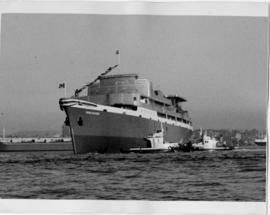 "Vancouver" launched about two minutes previously and about 400 yards from Burrard Dry Dock in North Vancouver. 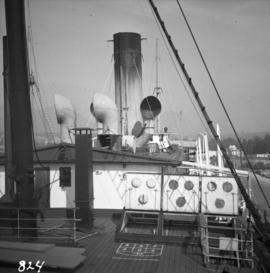 The photograph was taken from the sailing dinghy "Ceiriog". 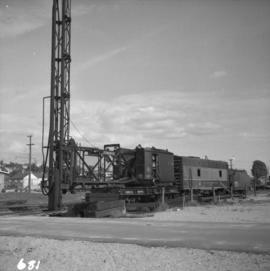 Photograph depicts a Canadian National Railway (CN) steam pile driver and steam generator used to make pile bridge over Mosquito Creek in North Vancouver, to increase the Pacific Great eastern trackage by one more set of tracks. 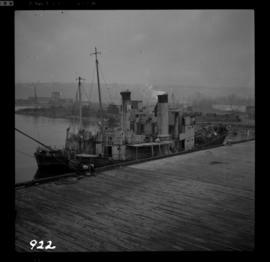 Photograph depicts a CNR ship named "Canadian Prince" being gutted, with the material on the scow at left. Alongside at right is the CPR "Princess Lousie" at Lynn Terminals, North Vancouver. 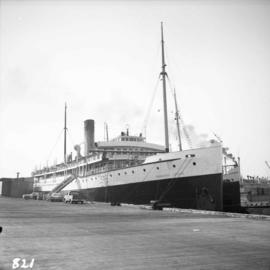 Photograph depicts a CPR ship named "Princess Louise" awaiting gutting at Lynn Terminals, North Vancouver. 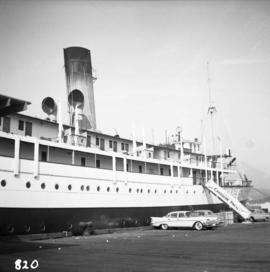 Photograph depicts a top deck of a CPR ship named "Princess Louise" awaiting gutting at Lynn Terminals, North Vancouver. 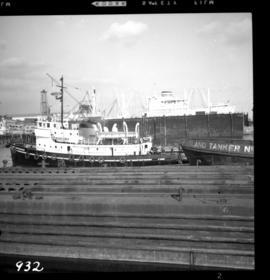 Photograph depicts a bridge of a CPR ship named "Princess Louise" awaiting gutting at Lynn Terminals, North Vancouver. 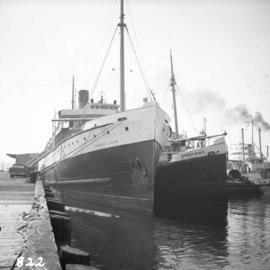 CPR "Princess Louise" and CNR "Canadian Prince"
Photograph depicts a CPR ship named "Princess Louise" with CNR "Canadian Prince" at Lynn Terminals, North Vancouver. 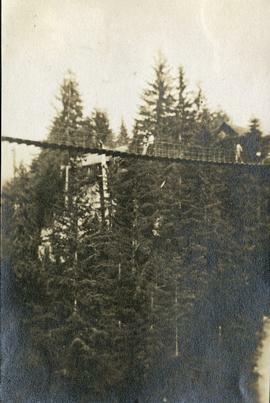 Photograph depicts a view from below, looking up at a suspension bridge. Three or more people are walking on the bridge. There is a forest and building in the background. 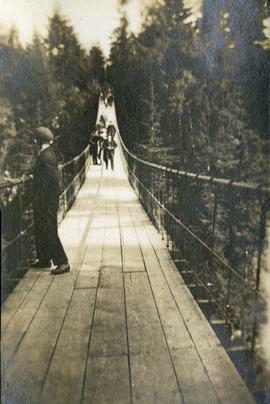 Photograph depicts a walkway view of a suspension bridge. Several people are walking on the bridge. 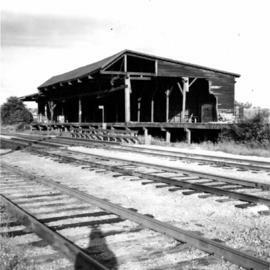 Sign says "Pacific Great Eastern Railway Company - Explosives - Handle Carefully - Keep Fire Away - North Vancouver Station June 25 1969". Also includes condensed rules for handling cars with explosives. 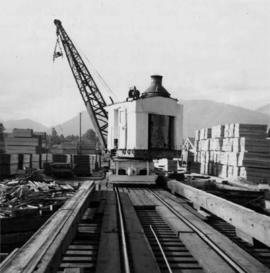 Photograph depicts the bull chain skid at the Horne Bros. Ltd. Shingle mill on #305 West Esplanade St. in North Vancouver. 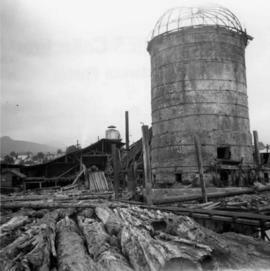 Photograph depicts a general view of the Horne Bros. shingle mill on #305 West Esplanade Rd. in North Vancouver. 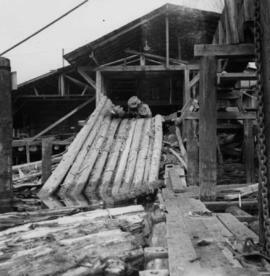 Photograph depicts a general view of a Horne Bros. Ltd. shingle mill on #305 West Esplanade Rd. in North Vancouver. Photograph depicts an abandoned brick burner now used to take excess steam blowing off from the wood fired double boiler. The burner is at the Horne Bros. Ltd. Shingle mill on #305 West Esplanade Rd. in North Vancouver. 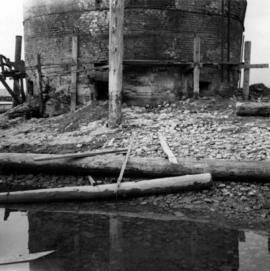 Photograph depicts an unused brick burner, surrounded at high tide by sea water. 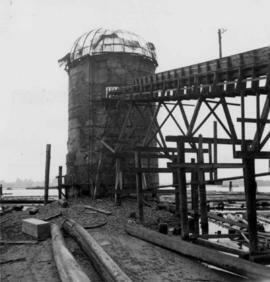 The burner is at the Horne Bros Ltd. Shingle mill on #305 West Esplanade Rd. in North Vancouver. 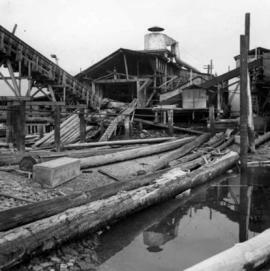 Photograph depicts a view of the booming ground of the Horne Bros. Shingle Co. Ltd. On #305 West Esplanade Rd. in North Vancouver. 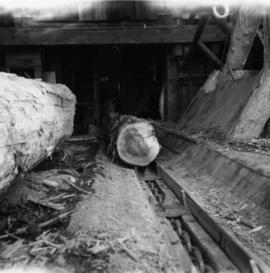 Photograph depicts a view of the main saw and bull chain of the Horne Bros. Ltd. Shingle mill on #305 West Esplanade Rd. in North Vancouver. 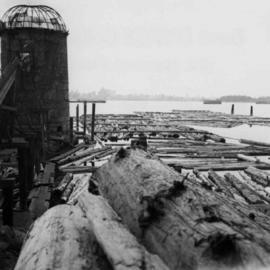 Photograph depicts a the shoreline of Vancouver Harbour, looking east from the property line of the Burrard Grain Elevator, 375 Low Level Rd, North Vancouver. 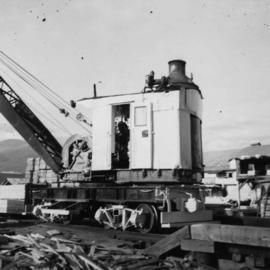 Steam crane in yard of Lions Gate Lumber Co. 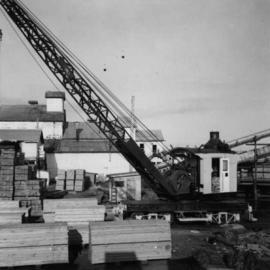 Photograph depicts a steam crane in the yard of the Lions Gate Lumber Co. on the foot of Lloyd St. in the North Vancouver. 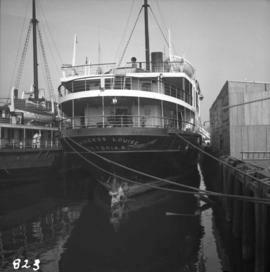 It has been freshly painted with a yellow exterior, white interior, and black boiler. 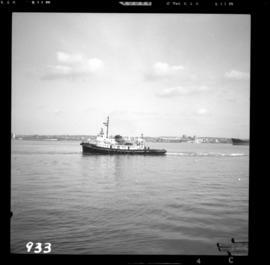 Photograph depicts the tugboat "Island Sovereign" with Burrard floating dock in the background. 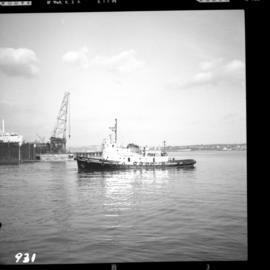 Photograph depicts the tugboat "Island Sovereign" going to turn starboard after backing out from the dock. The view is looking southeast. 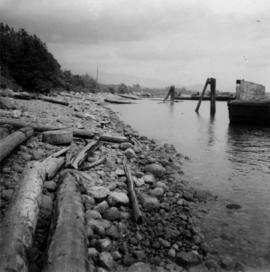 Photograph depicts the tugboat "Island Sovereign" backing out at North Vancouver. 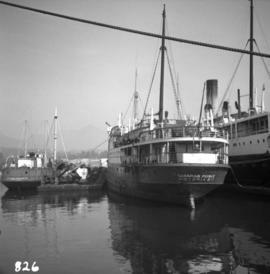 Photograph depicts two steam whalers at North Vancouver awaiting breaking up.